There is a 'wintermix 06' you can find here at a japanese site with 3 UW mashups in it. Guess what? another BS mashup! Looks like there will be a release of an other BS mashup/remix next year. it's already outthere in torrent/p2p land. And here another 10 mins. Piece about the Breaking and Entering soundtrack in the Sunday times. In january the 2 cd Remixes and Rarities by Dave Clarcke will be released. This saturday the 25th, German Bigcitybeats radio will broadcast 2 hours of the Cocoon gig and an interview with the band. Details here, site is in german. If you can't recieve this radiostation, there is a live stream via BigRadio. stream. 22:00 - 00:00 German time (GMT +1). Worldclock. Update: Broadcast is over, they broadcasted 2 hours of the UW concert but not the interview. They interview you can download as of monday from their site here. UPDATE! The interview is up now at this page. In last sundays Independent was a very good interview/review about Underworld and the cocoon gig. I´ve created a group at Youtube to collect Underworld live concert videos posted there. There are tons of vids made with phonecams at youtube. After you joined the group, you can add them yourself with the ´add to groups´ link. I´ve added a few videos already of the south american concerts. There is a one page article about the Cocoon gig in decembers Mixmag. Today the members archive at underworldlive.com has been updated with 4 videos of the Cocoon gig/webcast! Today ,Nov 18th, Underworld is playing at Creamfields Rio de Janeiro . There are a couple of phone vids at youtube. Some might have seen this before but it was new to me. A video of Johan Gielen playing his remix of BS during Sunrise Festival 23/07/05. 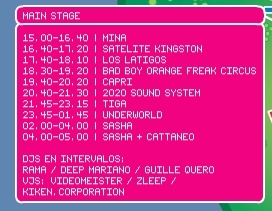 Tonight underworld plays during the Sirena Party in Sao Paulo, Brazil. You can read a review of the Buenos Aires Creamfield here in spanish. Comes with a little picture of Karl. And lots more at Clubber.com.ar. Lots and lots of videos at youtube of creamfields incl some underworld ones. Mixingbowl is torrenting 21 mins radiobroadcast. Karl was 'live' at the BBC radio 1 studio during Rob da Bank show for an interview on the monday 13th radio1 leftfields show. You can listen back for a week here. Or dl it from themixingbowl. Karl told a bit about underworld, was asked about the recent live gigs and the movie soundtracks. He also had some music with him that got played. Indeed a Smash-up rather then a mash-up. Underworld's Dark and Long vs. German rockers Rammstein - America. It's called Kiss you in America. Send to me by Cow Tse Tung, thnx. Underworld will preform their first ever gigs in south america over the next week. Tonight, 11-11, they play at Creamfields Buenos Aires. Metro 95 is going to broadcast from there but it´ll be interviews only I guess. Last friday there was an interview with Karl about the breaking and entering soundtrack during the Phill Jupitus morning show at 6 music. You can listen back for one week here. You can read the tracklisting there too. He plays a couple of UW tracks an some tracks of the soundtrack too. There are a number of pictures posted at flickr of these 2 concerts. thnx to the photographers.